My rule of thumb for ethnic cook books is for them to be written by a native who has lived in the West and knows West ingredient names. Ms Dunlop is an exception. She spent considerable time traveling and cooking in China with the eye of a trained chef. Her interpretations are first rate. I probably reach for this book the most out of all the books on my shelf. The flavours of her dishes are bright and taste - I hesitate to use this word, since it is often over-used - authentic. Excellent salad. Substituted sambal oelek for the pickled chiles. I often make this with lettuce thrown in as well. Great on the side of grilled meats. Delicious salad, but SO spicy--I even decreased the amount of chili oil to 2t and this salad is still incredibly hot! I really like the below idea to toss in some lettuce next time, for a change of texture. This salad seems like it would make a really nice garnish to a fried rice or other Asian bowl meal. Dead simple to throw together, too. I made both variations. I prefer variation #1 because of the addition of sesame oil and the salted chiles I have is spicier than the dried red pepper flakes. To me, variation #2 is greasier because of the hot oil, but it was my husband's choice because it has less vinegar and he has an aversion to vinegar. I adapted this to braise a whole tied pork shoulder in the oven at 325 for two hours. Magnifico. And the braising liquid will be the basis for a fabulous soup. 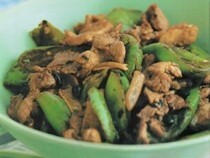 A great, mild dish with loads of sweet grassy flavour from the peppers. It does take a bit to time to get a good char on the peppers, but is totally worth it. Makes a generous meal for two with rice (and probably leftovers). Delicious! Used one package baked tofu, 2/3 package bacon (skipped the steaming), and thinly sliced greens of one leek. This is one of my all-time favorite recipes. I start to crave it if I don't have it once a month. I up the amount of cumin, and grind the fresh seeds coarsely. I used to try to cut back on the oil, but don't any longer. The greater amount of oil gives the meat a beautifully silky texture and you pour most of the oil out anyway. I use flank steak almost exclusively. Quick and easy with a nice level of heat. Fragrant with cumin, and it does yield a tender result. The marinade makes a sort of sticky sauce for the beef. We did cut back on the chiles. The biggest problem was pouring the excess oil out of the wok, but otherwise it came together quickly. Served with plain rice and a quick cabbage salad. Flavorful, we loved this. I'm just reading the earlier notes here that said the marinade made a sticky sauce, I discarded my marinade, I thought this is supposed to be a dry dish. I thought this was pretty good. My husband thought there was too much cumin. Two things I was not expecting: (1) the potato flour in the marinade caused the marinade to become a thick paste which had to be massaged into the meat. 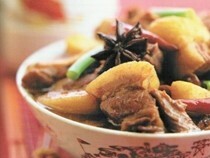 (2) the use of so much oil to fry the meat. You will definitely want to wear a apron and use a splatter shield over your pan--hot oil bombs flying around the kitchen, ouch! Very nice sauce. We used 2t of chili flakes (the minimum recommended amount), and found it to be plenty spicy. The oil splattering is definitely pretty intense in this recipe. I added the marinade to the pan along with the beef, but not clear if I was actually supposed to do that (I have had this issue with a few Dunlop recipes; the rare instance where her instructions are unclear). Anyway, a bit of a user error, bf cut the meat into rather large cubes rather than thin strips. So the texture was a bit off, but the sauce was delicious, and I'd definitely try this again with the meat cut more nicely for a stirfry. I took a few short cuts on this and made everything in a Dutch oven rather than using a wok to brown and switching to a casserole. I also used very small potatoes, did not peel or fry. The potatoes came out fantastically even without the frying. The meat in this dish was incredibly tender and nicely flavoured. Will make again. Wow, this was absolutely delicious. I don't see how this version could be topped, but I do want to try out the other version as well. An okay dish, nothing spectacular, not as gingery as I would like. Just basic pantry ingredients and simple execution. No comparison to my mom's ginger chicken which uses young ginger and tamed with honey. A very simple recipe and the directions worked perfectly, though I did seed my peppers (couldn't help myself). It was tasty enough and a good way of using up the last of my shishitos which weren't tasty enough to eat on their own but I wouldn't rush to make it again. I made the variation of this, using chicken eggs instead of duck eggs. I used to make this dish the way my mom did it, using the same batter, she would made a whole bunch of individual 4” omelets. Fuschia Dunlop’s way of making one large omelet with all the batter is so much more efficient, I’ll be doing it this way from now on. This was good, but not great. I've had much, much better tasting steamed fish using other sources. Felt a bit like I wasted good fresh whole sea bream fish. I finally got around to making this; it has rave reviews on the chowhound COTM thread. It was very good, although I had no potato flour for the marinade so substituted half cornstarch and half rice flour. It didn't turn the pretty golden brown color in the photo. I will also cut back on the oil next time. This was quite flavorful and I will definitely make this again. I wouldn't hesitate to make this with regular chives. 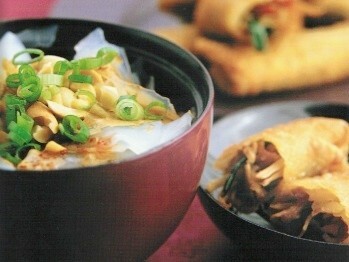 A tasty meal, but I enjoyed the "Home Style Bean Curd" from this book a bit more. My first use of this book and wow, this is a delicious tofu dish. I didn't have pork loin so I substituted two sliced Chinese sausages--not exactly the most authentic choice in the context of this dish, but boy, was it tasty. I also used Sambal Oelek in place of the salted chiles. There is not much chopping involved here so prep goes by very quickly--and, since shallow-fried tofu always takes a bit of time, I was able to do most of the prep while waiting on each batch to crisp up. I only used about 1/4t of red pepper flakes but would up that amount slightly in the future as we like our stirfries quite spicy. This was really good and would be made even better with a homemade stock. Next time! Can use regular chives and add one sliced garlic clove, but much better with Chinese chives if available. A fun way to use favas in season. This was tasty, very fast, and surprisingly flavorful. I didn't have any stock so I just skipped the 4T called for. My mushrooms threw off some liquid so I didn't miss the stock. I've made this dish twice now and love it. It works with ordinary green cabbage if you slice it thinly. The sesame oil finish is key. Yum. Really delicious flavor for so few ingredients. I agree that the sesame oil finish is key. I really enjoyed this - I was thinking vinegar would make it even better and then read nathanieldaw's comment, so off to find the fish fragrant eggplant recipe! This is basically the fish fragrant eggplant from Dunlop's "Land of Plenty", plus pork and minus sugar and vinegar. I think it's best with all three! My mom would never make this recipe, as she claimed that soy sauce would impart a sour taste to the winter melon and she would never use soy sauce on winter melon. But since I got 15 melons from one vine in my garden, I'll try any winter melon recipes that are not overly fussy. This is actually pretty good if you don't mind the slight sour note in the melon. It may not be traditional, but I think an egg would go very well in this. Made just the beef, which really does go well with mashed potatoes. The beef becomes quite gelatinous and the flavours permeate it ( and the house). The amount of chile called for is quite high - I used half as much and it was still,quite spicy. Very simple to put together. This recipe makes a bowl of super spicy, umami meat sauce that is then ladled into a bowl of soy sauce, scallions, noodles and broth as per the general "soupy noodles" instructions on pg 260. I had to substitute sliced water chestnuts for the bamboo, but otherwise followed the recipe as written. I used a nice homemade stock for the sauce portion of the recipe, but had to use a store-bought stock for the noodles. To up the flavor a bit, I simmered a few hunks of crushed ginger in the stock, which I think helped. Next time I might decrease the amount of red pepper flakes in this dish slightly, because we were both coughing quite a bit while eating. Perhaps I might just replace some of them with sambal oelek, which never seems to give me that reaction, no matter how much I use. Either way, the flavor here was very tasty, and the mix of stock and meat sauce produced a nice bowl of noodles. This was easy to make and nice but it was a bit bland. I did have to substitute sambal olek for the salted chiles which may have cut back on the flavor. This recipe was perfect as I also had cooked chicken breasts and shiitake mushrooms and green onions to use up. I changed the recipe around quite a bit, using fresh instead of dried shiitakes and sliced red pepper instead of bean sprouts. Also, previously cooked chicken instead of raw and olive oil instead of peanut oil (I'd run out of the latter). I had a bit of a noodle clumping problem when the noodles hit the hot pan. Nevertheless, this was a good dish, easy to riff on and a good vehicle for leftovers. Extremely quick (except for the soaking time) and delicious. Recipes and fascinating tales from one of China's most vibrant culinary regions. Fuchsia Dunlop is the author of the much-loved and critically acclaimed Sichuanese cookbook Land of Plenty, which won the British Guild of Food Writers' Jeremy Round Award for best first book and which critic John Thorne called a seminal exploration of one of China's great regional cuisines. Now, with Revolutionary Chinese Cookbook, she introduces us to the delicious tastes of Hunan, Chairman Mao's home province.